It took several home wins but the Washington Nationals finally gave a shaving cream pie to a post-game interview player. On Thursday night, after a win and a sweep against the Chicago White Sox, Ryan Mattheus was discussing his relief appearance. Meanwhile, Drew Storen was sneaking up behind him. 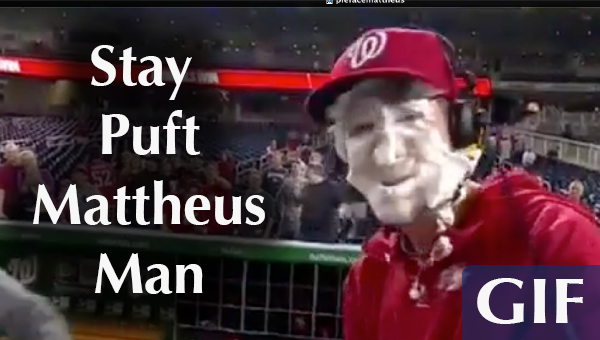 Mattheus was mid sentence when Storen smashed (literally) a towel full of shaving cream into the face of Mattheus. Ryan seemed a little bit upset at the force of the action, but was overall in a good mood after a win. Dan Haren had another shaky game and Mattheus came on to kill 2 middle innings picking up his 2nd hold of the season in the process. With Akra gone (see some awesome Akra moments) the Nats players are now just talking directly to Bob & FP via on field microphone. We really miss watching her get soaked.